The Kansas City Chiefs held on to Chris Conley in the fourth and final year of his contract, where he was earning a little over $2 million of his $4 million deal. 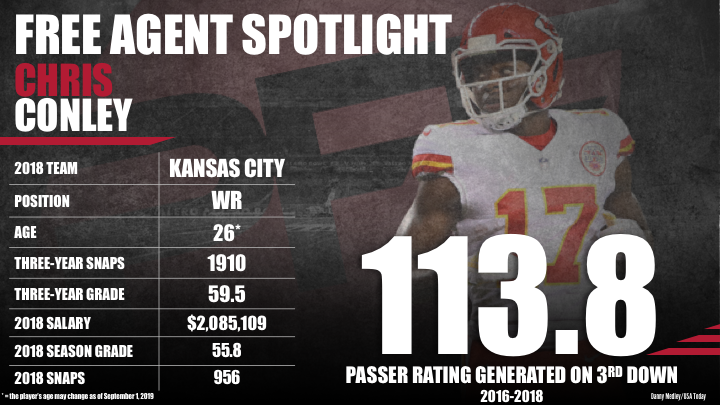 Conley played third fiddle to Tyreek Hill and Sammy Watkins as he saw the third-most targets (47) among Kansas City wide receivers and fourth-most on the whole team. The 2015 third-round pick out of Georgia earned a 55.8 2018 season grade which was hurt by his ball-security and drop issues. Chris Conley has amassed 112 catches throughout his four-year stint with Kansas City and had career-high totals in snaps and touchdowns in 2018. Even with these career-high totals, Conley had a relatively poor 2018 campaign as he posted above-average grades (60.0) in just six of the 16 regular season games this season. A team that is in need of a veteran presence or depth at the wide receiver position will most likely be the team to sign Conley to a low-risk deal. Subscribe to Pro Football Focus’ ELITE subscription to research Chris Conley’s grades, advanced stats, snaps and more in Premium Stats 2.0.